There was a note of urgency to the listing. Update on the RE-LAUNCH and RE-QUEST anthos from Pole to Pole Publishing — we’ve accepted 21 of the 26 pieces needed to fill the 2 anthos. We have 1 new submission yet to read, and 4 (2 per antho) we’re still considering. If you’re thinking of sending us something — don’t wait! (Reprints only, 3,000 – 5,000 words). Well, I had been thinking of sending them something and so, at the very, very end of January, I sent a story to each. 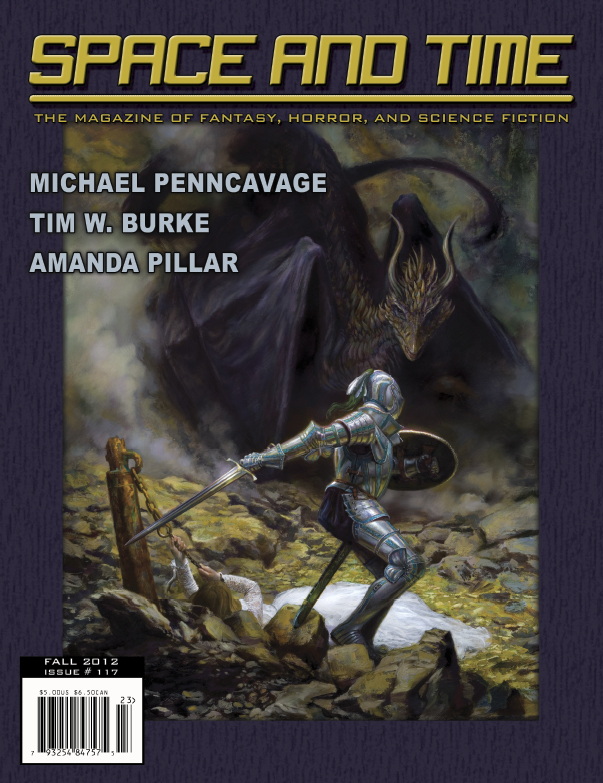 So now, only two days into February, the first word has come back from Editors Kelly A. Harmon and Vonnie Winslow Crist: Thank you for sending “The Blade of Gudrin” for Pole to Pole Publishing’s “Re-Quest,” anthology. We appreciate the chance to read it, and have decided to accept “The Blade of Gudrin” for inclusion in the anthology. Your contract and additional information will be sent to you in a few weeks. This is for the fantasy entry of the pair (with RE-LAUNCH for science fiction), with “The Blade of Gudrin” going all the way back to the Spring 1993 issue of SPACE AND TIME (there was a premium for reprints first printed a long time ago). While as for the other . . . well, time will tell, but if it’s accepted too you’ll find out about it here. Only weeks away from the coming election, the Fall issue of SPACE AND TIME has arrived with a poem of mine in it, “Why Not Let Zombies Vote?” (see July 2). In it the usual opposition is raised, then countered (“Okay, so they eat people, but isn’t that/ just a choice of diet?”), along with other frankly prejudicial objections (“and don’t be blaming them for the recession.”). So, indeed why not, and just in time here for early voting? This is issue #117 of a venerable magazine going back to probably about the time I started writing poetry in a serious manner. Cf. also October 21 2011 and June 6 2012, below, for notes on another poem of mine, “Monkey See” — the second in what I think of as my King Kong Trilogy (poem #1 was in PAPER CROW, #3 is as yet unpublished) — which was accepted by Poetry Editor Linda D. Addison for the Fall 2011 SPACE AND TIME and went on to appear in the 2012 RHYSLING ANTHOLOGY. Then in other activity, this afternoon I finished going through the proof sheets for my upcoming e-novelette PEDS (see May 21, et al.). If all goes well, PEDS should be out before the end of the month — in time, that is, for Halloween giving to friends with a taste for dystopic science fiction — from Untreed Reads Publishing.